Eject the CD Tray ergo open the DVD or Blue-Ray drive in windows 10, the example is also for Windows 8.1 suitable! The simple solution in this example is also suitable for Windows Server 2012 R2 and Web server 2016. It is so easy to open the DVD or CD drive! You will see that you don't have to use third-party software to eject DVDs or CDs! 1.) ... Open in Window 10 the DVD or CD drive from MS-Explorer! 2.) ... Eject the DVD or CD via Windows-10 Disk Management! 3.) ... Problems with the CD / DVD-ROM drive in Windows 10! 1.) Open in Window 10 the DVD or CD drive from MS-Explorer! 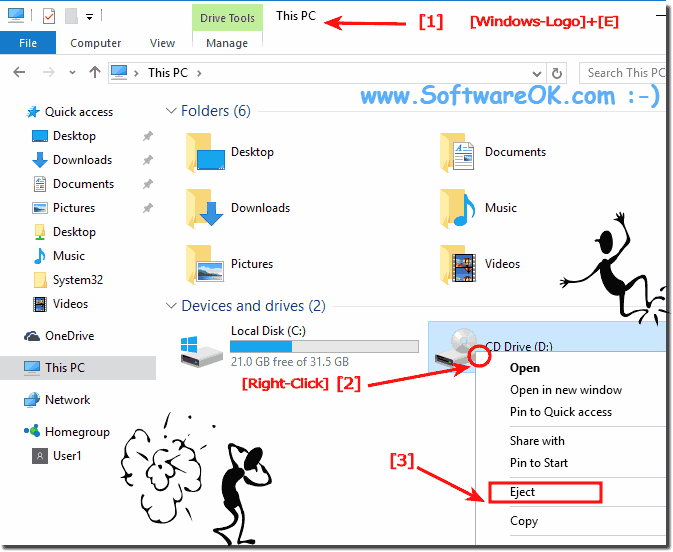 (Image-1) Eject eg open the dvd or cd drive in Windows-10! 2.) Eject the DVD or CD via Windows-10 Disk Management! Please run the Disk Management, for example via Windows-Logo+X Keyboard Shortcut and select "Disk Management" do a right click on the CD/DVD-Rom and select Eject. (... see Image-2 Arrow 1 to 3). 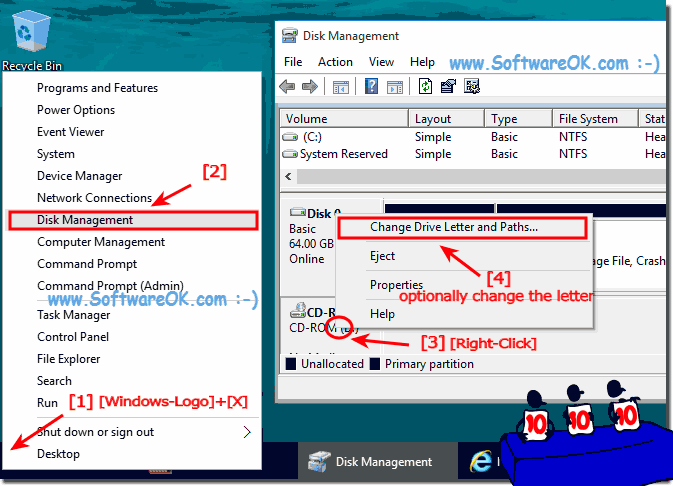 (Image-2) Open the dvd or cd drive in windows 10 and change the Letter! 3.) Problems with the CD / DVD-ROM drive in Windows 10! The cause of the problem may be a malfunction or failure of the CD / DVD drive drivers. It is also possible that the drive itself is out of service. If you hear a grinding noise when inserting a disc, fast, slow, it is possible that the laser is dirty or defective. If such a reaction occurs only on a DVD, the problem is with the DVD; it is possible that the disc itself has been damaged or improperly recorded. The problem may be in the drivers or the software for DVDs / CDs writing. See: ► Find new driver software via the Windows Device Manager! 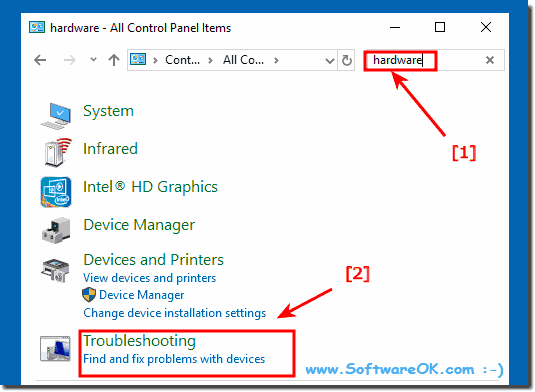 Resolving the problem of a CD / DVD-ROM drive in Windows 10, the ► Troubleshooting in Windows 10 for computer problems , Hardware and Sound, see the section Device Configuration . If non methods help, you should revert to the previous version of the operating system, or use a Windows 10 recovery point where all devices worked stably. If the CD or DVD drive suddenly stops working, or disappears from the MS Explorer. For drivers, or software errors, it can be fixed with a few clicks. If the cause is hardware damage, the device should be brought to repair. ►►. .. After Windows 10 Update no CD / DVD drive in the MS-Explorer!! This elegant solution and tips to remove a DVD or CD from the drive is not just written for Windows 10. As you can see above in Windows 10 shot screenshot, you can open this drive flip example as a solution without hesitation also apply to earlier versions of Microsoft's Windows operating systems, no matter if it is a drive on home Windows desktop PC, an external on tablet, Surface Pro / Go, or even a windows server operating system drive is.